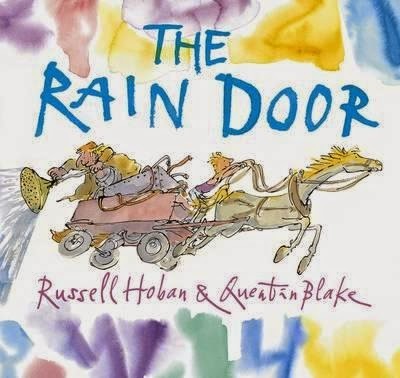 First published in 1986, this edition of The Rain Door follows the release of Russell Hoban’s new work, Rosie’s Magic Horse, which was published posthumously soon after his Soonchild, both through Walker Books in 2012. On a hot summer day in London, Harry sees the rag-and-bone man pass by. He follows him and his wagon, and his magical words that Harry couldn’t comprehend, through the shade shape of the rain door. A voice urges and warns at the same time, about what he should expect on the other side. Harry is ready for adventure, and rain. On the other side is the rag-and-bone man’s collection of oddities scattered everywhere. What does this magical place hold for Harry? In an imaginative and thought-provoking adventure about the other side of reality, Harry has a lion, a dinosaur, a horn that goes GAHOOGA and lots of rain to contend with. Will he be able to get back home, and how? Quentin Blake’s easily identifiable watercolour and pen art beautifully translate the text with coloured swirls of fascination and magic.